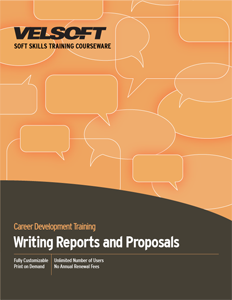 This training courseware title provides everything you need to professionally deliver Writing Reports and Proposals training including editable training manual, hands-on exercises, exercise files, detailed instructor guide, classroom-ready PowerPoint slides, and unlimited online learning licensing. Seeing is Believing This sample manual to teach Writing Reports and Proposals is in MS Word format. This two-day workshop is intended to help participants do the writing their job demands. If participants are a manager at any level in business, government, or industry, they must write reports. Whether they want to or not, they write to explain things, to smooth relationships and to convince others of the value of some course of action. Writing must be clear, concise, complete, and correct. It must also convey their message in a courteous tone. The workshop will help participants to identify the range of this kind of writing, the forms it takes, and the persuasive techniques it requires.